[Spoiler alert!] 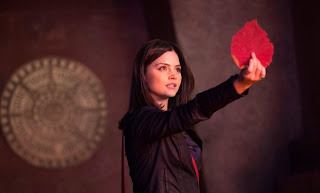 So the mystery of Clara Oswald continued this week, but what really got me excited was the time spent delving into one of my favourite Doctor Who themes: the power of storytelling. Stories have saved the Doctor's life before, of course. That was the big climax of Season Five. 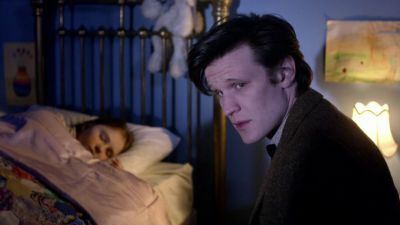 As the Doctor was traveling back in time, gradually being erased from history (or "unwritten" as he'd put it), he sat by the bedside of the young Amelia Pond. Soon, he'd be gone and she wouldn't remember him as anything but a childhood tale. But that was okay. "We're all stories in the end," the Doctor told her. And that's all he needed to survive: when Amy remembered the story of the Doctor and the TARDIS (that borrowed blue box, both new and old) at her wedding, it brought the Doctor back into existence. But this week, the stories did more than just save the Doctor — they saved an entire solar system. 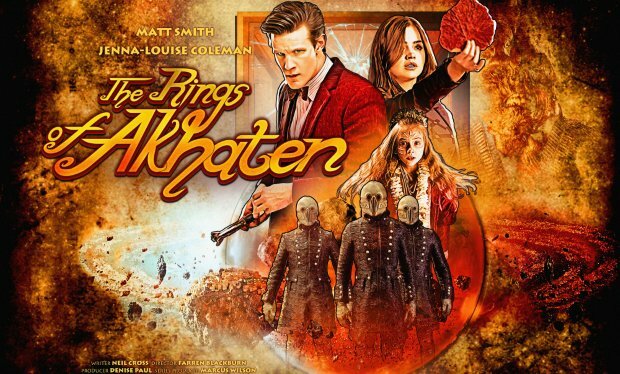 This particular solar system is the setting for Clara's first voyage with the Doctor: to the seven planets orbiting a sun called Akhaten, where the local people believe that all life in the universe began. That creation myth is the episode's first overt reference to storytelling ("All life?" Clara asks. "Did it?" "Well," says the Doctor, "it's what they believe. It's a nice story.") but it's just the first faint hint of what's to come. The importance of storytelling to the residents of this solar system goes way beyond that. You see, as it turns out, the big orangeyellowred star at the centre of the solar system isn't really a star at all. It's a great big beast — the "Old God" of the local religion, but not really a god either — and it literally feeds on stories. To keep it from getting hungry and waking up angry, the people are constantly feeding it: a series of monks has been singing to it non-stop for eons. "The Long Song," the Doctor explains, "a lullaby without end to feed the Old God, keep him asleep. It's been going for millions of years... generation after generation after generation." But the Long Song isn't enough to keep the Old God's appetite in check. And so, about once every thousand years, when the rings around the "star" are in perfect alignment, the locals give the Old God a feast of stories. A young girl called the Queen of Years sings a particularly special song, drawing on the entire history of the solar system. "I'm the vessel of our history," she tells Clara at one point. "I know every chronicle, every poem, every legend, every song." The value of the objects (like everything else in the universe, Sartre would say) comes from the meaning we give them — in other words, the stories we tell ourselves about them. And since these objects are made of stories, the Old God can feed on them, too. As the little girl sings her song at the Festival of Offerings, the audience allows the Old God to consume the mementos they have brought as a sacrifice. But this time, the song and the mementos aren't enough. The Old God is still hungry and he's waking up. As a last resort, the Queen of Years is supposed to sacrifice herself to him — so he can consume her soul. "We're all stories in the end." So the show might be inviting us to draw some parallels between the Doctor and that giant story-eating star-beast. And it's not that hard to do. On his worst days, I imagine the Doctor kind of sees himself this way — remember the Dream Lord? — as a parasite who lives off the companionship (and therefore the stories and the souls) of human beings, bringing them along with him on his adventures so they can create new stories together... even though he knows he's putting them in danger and will eventually abandon them. 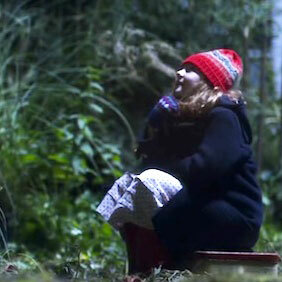 (Even his own granddaughter ends up in tears, locked out of the TARDIS and left behind.) The Doctor also has a strong appetite for particularly interesting stories — the more interesting a companion's story, the more attracted the Doctor seems to be: that's why he chose Amy to travel with him in Season Five and that's why he's choosing Clara now. Of course, in reality, his relationship with people is much more symbiotic than parasitic — he gains stories through them and they gain stories through him. They give each other meaning. Just like we all give each other meaning. And you could maybe dig around into the idea of the Old God-as-metaphor even more than that. Doctor Who, like most good science fiction, is usually commenting on modern society. Many of the past episodes of the show are about British imperialism — and if you look at the story of the Old God in that light, it's easy to imagine the Empire as a ravenous star-beast engulfing worlds and devouring them for their stories. (It also makes me think of something Jean-Luc Godard says in Éloge de l'Amour: that Americans invade other countries because they don't have their own history; they need to steal someone else's.) You can apply the same star-beast metaphor to colonialism in general, or to the appropriation of indigenous culture, or to other aspects of modern Western civilization: a massive story-eating star-beast with an insatiable appetite strikes me as a much more interesting analogy for the Internet and 21st century consumer culture than last week's "wi-fi eats people" did. But Doctor Who realizes that stories are about more than consumption. We don't just passively ingest stories, we actively use them as tools: they are the way we make sense of our world, construct our morality, make decisions, spur ourselves into action. That, I think, was one of the main themes back in Season Five. I'm nerdily convinced the Doctor was subtly but consciously harnessing the power of storytelling and narrative in his relationship with Amy and Rory. First, to convince the girl with the fairy tale name to come away with the Raggedy Man in the blue box — when she chewed him out for being more than a decade late, he turned it into a narrative: "the girl who waited". (Later, adult Amy even asks him to go back in time and visit her while she's waiting as a child — to tell her the story of their adventures.) And then again, when the Doctor wanted to make sure Amy and Rory ended up together, he invited Rory onto the TARDIS so that the two of them could share their time-traveling stories together. In the Dream Lord episode, he (unconsciously) created two fictional worlds with two different stories so that Amy was finally forced to choose Rory. And then, by the end of the season, Rory had become "the boy who waited," cementing their relationship for good. The story, in the end, wasn't about Amelia Pond and the Doctor, but about Rory and Amy Williams. The Doctor made sure that's the way it got written. 1. "Do you mind if I tell you a story?" the Doctor asks the Queen of Years as the Old God wakes. "One you might not have heard?" To counter the creation myth of her solar system, he tells her the creation story as told by science: the one where we're all made of stardust, elements forged in the furnaces of distant suns that are brought together through sheer chance, against all the odds, to create unique, precious people with unique, precious stories. That's what convinces the Queen that she shouldn't sacrifice herself to the Old God (and that she should also free Clara, who she'd trapped using her psychic powers). 2. Clara is free, but they're all still in danger, trapped inside the pyramid temple as the scary Vigil henchmen try to capture the Queen of Years and sacrifice her against her will. That's when Clara has an idea. "You know all the stories," she says to the young Queen, "you must know if there's another way out." And the girl does know a story that can save them. She sings a song that opens a secret door. They escape and Clara takes the Queen of Years away to safety, while the Doctor stays behind to fight the Old God. 3. The Doctor's not exactly sure how to fight the Old God — that is, until he hears the Queen (and the other people of the solar system) singing a different song (a different story), one where the God wakes up. That's when the Doctor decides on a course of action. "Okay then, that's what I'll do: I will tell you a story..." he says. "You're not a god, you're just a parasite full of jealously and envy and longing for the lives of others. You feed on them. On the memory of love and loss and birth and death and joy and sorrow. So... so... come on then. Take mine. Take my memories. But I hope you've got a big appetite. Because I've lived a long life and I have seen a few things." The Old God feeds on the Doctor's vast soul full of stories, but it's still not enough. 4. Clara, watching from a neighbouring planet, isn't sure what to do. But then, in a flashback, she remembers what her mother told her after she'd gotten lost as a child. It's the same thing she told the Queen of Years to reassure her earlier. "She told me a story," Clara explained. Her mother said to her, "It doesn't matter where you are, in the jungle or the desert or on the moon... I'll always come find you. Every single time... Every single time..." And so, remembering her mother's story along with what the Doctor told her about life on the TARDIS ("We never walk away"), Clara is spurred into action. She rushes off to save the Doctor and defeat the Old God. "The most important leaf in human history." 5. We still don't know much about Clara and who she is, but we do know this: she seems to have her own history, her own memories, her own stories. And so far they tend to revolve around her dead mother. Earlier, in the alien marketplace, she used the sentimental value of her mother's ring to buy the space moped which she now uses to reach the Doctor. And she still has the red leaf that we first saw last episode — and which we now know from the beginning of this one, played an important role in the story of how her parents met, of how two unique, precious people came together, against all the odds, through sheer chance. "The most important leaf in human history," her father called it. And Clara calls it that too. "It's full of stories," she tells the Old God, "full of history. And full of a future that never got lived. Days that should have been that never were. Passed on to me. This leaf isn't just the past, it's a whole future that never happened. There are billions and millions of un-lived days for every day we live. An infinity. All the days that never came. And these are all my mums." And that — the infinity of stories about things that never happened — is finally too much for the Old God to consume. The star collapses. The people are safe. Stories have saved the solar system. So what does this mean for the rest of the series? Well, it does seem to have some pretty interesting implications for the mystery of Clara Oswald. She seems to think that she's a unique stardust miracle just like the rest of us, but the Doctor knows that she's not entirely unique. And so do we. Some of her story seems to belong to the other versions of Clara, as well. But this week's episode, at the very least, was a story that's entirely her own. When the Doctor gives her mother's ring back to her as a gift of appreciation from the people of the solar system she saved, he reminds us of that fact. It was this Clara who saved them. "You. No one else. Clara." And as her mystery unfolds over the weeks to come, I wonder if this will prove to be important: that the very first place the Doctor ever took her had so much to do with the power of stories. - There's lost of other power of storytelling-y stuff over the years: the story the Doctor and Martha use to defeat the Master, River Song's novel in "The Angels Take Manhattan", her diary, the time all those people are saved from carnivorous shadows by being archived in a planet-sized library containing every book ever written, the episode where the Doctor defeats a Victorian alien werewolf by doing historical research. "Books! Best weapons in the world," he says in that one. - Kinda maybe on the same topic, one of our little red contributors, Rebekah Hakkenberg, passed along a neat theory about Clara: that she's actually a living meme. - Last week, an anti-gravity motorcycle, this week a space moped. - The Doctor is still wearing Amy Pond's reading glasses. But when he and Clara need to buy the space moped with an object of sentimental value, he doesn't mention them. Instead, he lets Clara buy it with her mother's ring. - In the alien marketplace, the Doctor just wanders away and leaves Clara alone to explore. It that on purpose? So she can be off on her own on her first trip on the TARDIS? Like, as a test to see what she's capable of getting herself into? - Why doesn't the TARDIS automatically translate the barking of the alien moped vendor for Clara? - Last week, I mentioned that Clara had worn red in every episode. This week, along with the red leaf, she was also carrying a red bag. - Clara's maternal side: this week's interaction with the Queen of Years gave her lots of opportunity to demonstrate it yet again. - The Doctor has a thing about meeting the women he likes when they're little girls: Amelia Pond, Madame de Pompadour and now Clara Oswald (both in this episode and the prequel to the last one). Liiiiittle bit creepy. - Clara, unlike Amy, doesn't have to wait for the Doctor to show up. This time, he seems to get the timing right — not only when he picks her up, but also when he drops her off at the end of the episode. Usually, it's a bit unreliable, but this time the TARDIS lands on the very same day they left. Next Doctor Who recap: Doctor Who & The Cold Warriors. Previous Doctor Who recap: Doctor Who's Many, Many Questions.